At last I have finished my quilt blocks! Or finished them as much as I plan to- we’ll get to that in a minute. I really enjoyed this block. The original block from our class had a smaller circle but I wanted a different look so I enlarged the template circle a bit and am so excited that it turned out. I went on Pinterest to look up ideas for this block so check out my quilts board if you want to see other ways this can be used. I love how with just moving the blocks around, you can totally change the look of this block. I feel confident about sewing curved seams now. The only thing I didn’t like about the block was that it requires LOTS of pinning so it becomes quite time-consuming: difficult when your sewing time is limited to a toddler’s nap time. This block was our practice in applique. I have been doing quite a bit of applique recently so this was a review, but I enjoyed putting it together. I opted out of hand-appliqueing for time’s sake and did a straight stitch around all the edges. MUCH faster and I still like the effect though I do prefer a hand-applique look for a block like this. I used a freezer paper template for the center circle and even with this template, I had a hard time getting my circle completely round- but I’ve determined not to stress out about small imperfections! Ah…this block. What can I say about it? I spent much time painstakingly cutting out tiny diamonds, sewing said diamonds together, and mastering the y-seam, only to have to scrap this block for now. 😦 I was really happy with how this block was turning out as I was sewing my diamonds together. This y-seam thing wasn’t hard at all, I thought to myself. And then I began to sew the rows to each other. I just could not get them to work! The seams were so far off that in no way were they ever going to meet and I would have to resew all the individual rows to try to fix the problem. I also realized that my template was so tiny, I was going to have to make twice as many little blocks to fill my 18 inch big block. So, I scrapped it for now. 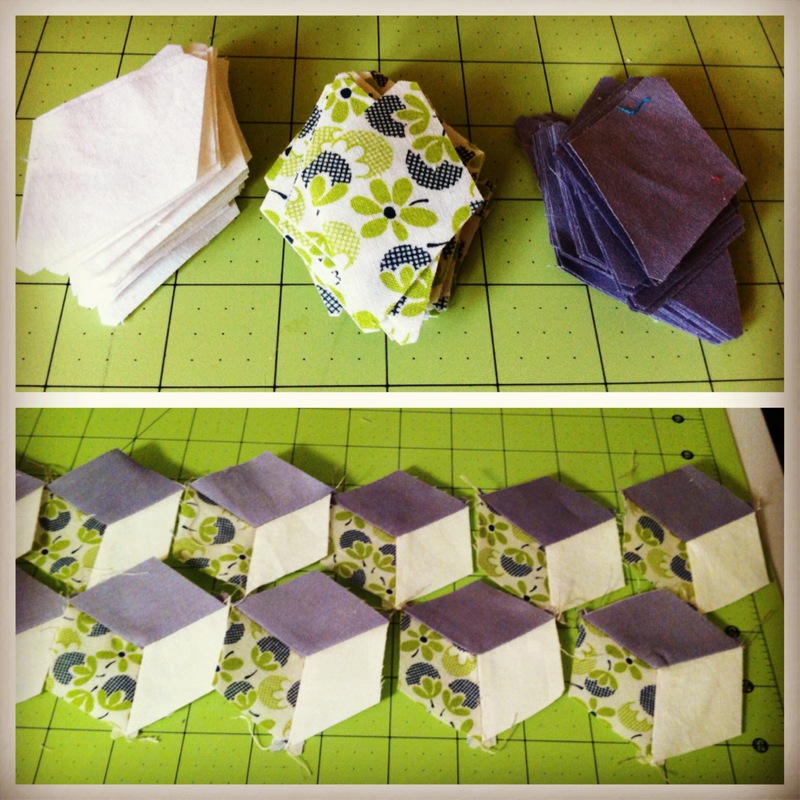 We had 10 blocks built into the class, and I only need 9 for my quilt top so it wasn’t a big deal to opt out of it. I would like to revisit this block at some point and learn how to make it correctly because I love the visual effect it gives. Here’s my instagram shot of my progress. Now that all my blocks were finished, I had to decide on sashing and borders. I was going to do a sashing between my blocks but the only solid I have on hand to match is a very dark grey, and I didn’t think it would look good so I decided to put them together with no sashing. However I am going to do a 6 inch border of the dark grey. I got as far as sewing all the blocks together tonight and will work on the border and backing tomorrow. I am pretty excited because tomorrow’s class begins the discussion of free motion quilting- something I very much want to learn! This entry was posted in Quilts and tagged dresden plate, drunkard's path block, quilting class, sampler quilt top, tumbling block, whipstitch by oliver's fancy. Bookmark the permalink.